The board heard arguments Thursday from attorney Francis Barrett, who represents the current owner Columbia REI. "We've considered all potential uses (that) are permitted under the DD, Downtown Development district zoning regulations, we've also considered the Main Street historic district regulations, and there's absolutely no permitted use which is economically feasible," Barrett said. "That is the test which this board must apply." Barrett presented several witnesses to make his arguments and their testimony spanned three hours. Columbia REI wants to tear it down and the site would be vacant while a development plan is finalized. Opponents including the Cincinnati Preservation Association and the Cincinnati Preservation Collective say the building should be saved since it is located in a historic district. Attorney Sean Suder represents those groups and says three city rules apply concerning demolition. "One you have to prove there is no economically viable use for the property," Suder said. "And you have to prove that there was something done to you by the regulations, the regulations deprived you of all economically viable use, and that it was not something of your own doing." Suder said the owner cannot prove that. The Historic Conservation Board has seven members, but two have recused themselves from the Dennison matter. So that leaves five to make the decision. The hearing Thursday started with all five present. But one member needed to leave for another appointment. The board proposed continuing the testimony with four members, and then meeting at a later date to make a decision. Attorneys on both sides of the case objected, saying all the members should hear all the testimony and reach a decision. At the next hearing the opponents will make their arguments and the board will hear public comments before deliberating and taking a vote. Cincinnati staffers recommended in April that the board reject an application to tear down the building. The city staff reported disagreed with the economic hardship claim. The building was built in 1892 for an ironworks company. 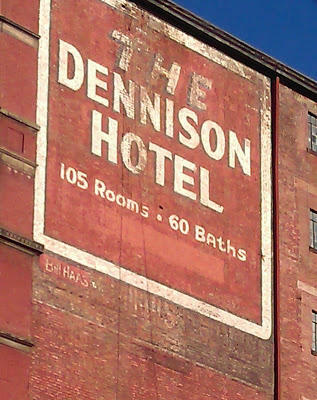 Later the eight-story building became the Dennison Hotel.